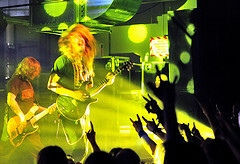 A friend suggested that I write a review of the Opeth show I attended on Saturday, May 2, 2009. I find myself quite incapable of doing so because, frankly, I cannot judge their music objectively or provide an accurate recounting of their performance. This inability stems from the fact that my experience of Opeth was not primarily aesthetic in nature. Rather, as has been the case with the best metal shows I have attended, my experience in the presence of these masters of the art tended more towards the mystical/ecstatic realms of human consciousness. Indeed, my most immediate memory of the show finds me in a state of frenetic, possessed movement accompanied by an ego-annihilating oceanic feeling. I give Opeth credit for inducing this state, a thing they accomplished via a sometimes subtly, sometimes savagely evolving rhythmic intensity coupled with serpentine melodies, strange words, and the trance-inducing repetition of droney, modal patterns. Through its deliberate and complex structures – not to mention the aggressive amplification of sound and hypnotic manipulation of light – Opeth’s music invited the listener to become lost in its labyrinth. However, it was not an all-devouring minotaur that awaited it us at the center of these intricate and winding passages. It was, instead, a refreshing, liberating, and, dare I say, “communal,” transcendence. For all who seek the fortuitous and often unexpected profane illumination sometimes afforded by the marriage of technology and spirit in this post-everything age, I recommend that you seek out Opeth and especially the public display of their conjurings.